It is a Monday, but I am choosing to be thankful. I am especially thankful for the lovely gummy butterflies that Husband bought for me over the weekend. Everyone needs a bit of colorful, gummy goodness every once in a while. I would just like to point out that it is 75* and sunny here in Virginia Beach. You know what makes that even better? It’s starting to snow in Buffalo. I understand that most people wouldn’t compare their own cities and towns to Buffalo (it is considered more comparable to faraway lands like Siberia, after all), but I used to live in Buffalo–for ten years. Then I lived in Montana (where it is currently 45* and snow is in the forecast for Tuesday). And I realize that our 75* will yield to 55* tomorrow, but for now, I want to revel in the fact that it will NOT snow before Halloween here. Sometimes I really love Virginia. Of course, come time to prepare for Christmas, I will be bemoaning the shortage of snow. Last year I was incredible bummed because not only was it my first Christmas away from my family (and my brand new husband was working really long hours at the time), but I just knew we wouldn’t have snow. My supervisor at work had NEVER seen a white Christmas. Ever since the age of 10, I have never NOT had a white Christmas. Then, on Christmas night, fluffy little white flakes began to fly and I was absolutely elated. In fact, it snowed enough (and the city is so ill prepared to clear roads) that Husband and I were snowbound the following day and he didn’t have to go to work. To make it better, we were living in a beach house. Snow on the beach? Yes please! We took our puppy for a walk and played in the strange mix of snow and sand. So come Christmas, I will be begging for snow. But for today, I am rejoicing in a lengthy fall. I just wanted to post this photo I took yesterday as a reminder of the beauty in the small things in life. 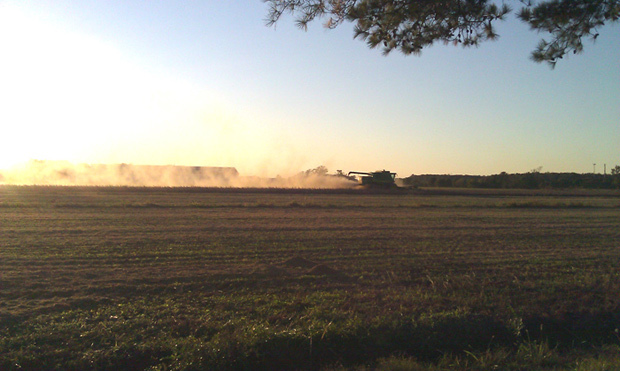 Although only for a moment between work, taking care of the horses, and heading off to small group, I was able to watch this combine harvest the soy beans in the field next to our house. It was a moment of peace and beauty in the midst of a hectic day. This past weekend was truly wonderful. In celebration of our first anniversary, Husband and I took a long weekend away from civilization. We packed up the car (my tiny, two-door Mitsubishi) with everything we needed for three days in the woods. I wish I had taken a picture of how stuffed my little car was, but somehow we managed to fit it all in. (The other vehicle option available to us was Husband’s truck which doesn’t have a back seat, so Ginger would have been sitting on my lap the entire way…very bad option considering her propensity toward car sickness). I think what I like most about fall are the traditions that go along with it. 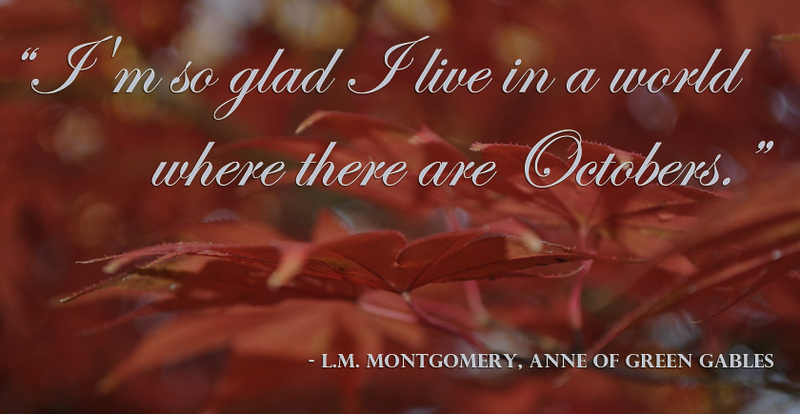 Fall is a beautiful time of year–time to slow down, enjoy the season, and spend time with family. I went pumpkin picking with Husband on a crisp, beautiful Sunday afternoon. I got to wear a jacket, gloves and a scarf, which made me happy. And we brought hot apple cider, which made Husband happy. We visited a pumpkin patch right around the corner from our house and we actually picked our own pumpkins right off the vine. Sure, the pumpkins were a little muddy, and kind of flat on one side, but we got to weed through the loopy vines and find little (and big) orange treasures. I liked that we were having an experience, a better experience than going to the local grocery store or Walmart for pumpkins shipped in from other places. I also liked that we were supporting a small farm venture in our neighborhood. In fact, the ladies behind the counter actually knew the family that had built the house we rent (circa 1949). Husband and I laughed and had fun, snapped pictures and sipped cider, and altogether thoroughly enjoyed making a memory. Even better, we are starting traditions in our marriage that will last for many years to come. It’s hard to believe that a full year has passed since my wedding. Sure, some things have become utterly comfortable—wearing two rings on my left ring finger, sharing a bed with a boy who rolls around in his sleep, the smell of coffee in the morning, etc. Yet it still somehow feels like the wedding was just yesterday. We watched the movie Julie & Julia last night. It was a film we saw almost two years ago in the theater, before we even started dating. That night Bob slyly talked me into going to dinner, coffee, and a movie with him. We were the only two people in the theater and he talked through the whole movie—all about French cooking and how awful it is. I didn’t get to really watch the movie itself until last night. I liked it =). There are so many more things that I could add to this list. I love the small things, the little moments, creating traditions, forging through life together, and having many adventures. Here’s to another year of adventure!